This document grants temporary powers of attorney. It specifies certain powers which the Attorney is to have during a certain time period, or until the power is revoked. 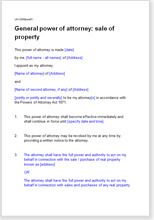 This document gives the attorney power to sell real property - a house, farm, some land or other real property. The attorney can be given only specific tasks relating to the same of the real property, or can be given the power to do everything to close the sale -you choose. You can of course, also specify matters which you do not want the Attorney to have control over. All Power of attorney documents have effect once signed (or otherwise, if you say so in the document). You can use this document for almost any situation - whether you are going to Australia to help prevent conflict diamond mining, flying to the moon, or going deep sea dives. It is useful because of its flexibility - you choose the what, how, where, when and who. This document is suitable for anyone who is going away, abroad, or who will be unable to manage either one or all of their affairs for a period of time. Signatures of Donor, Attorney and Witness.